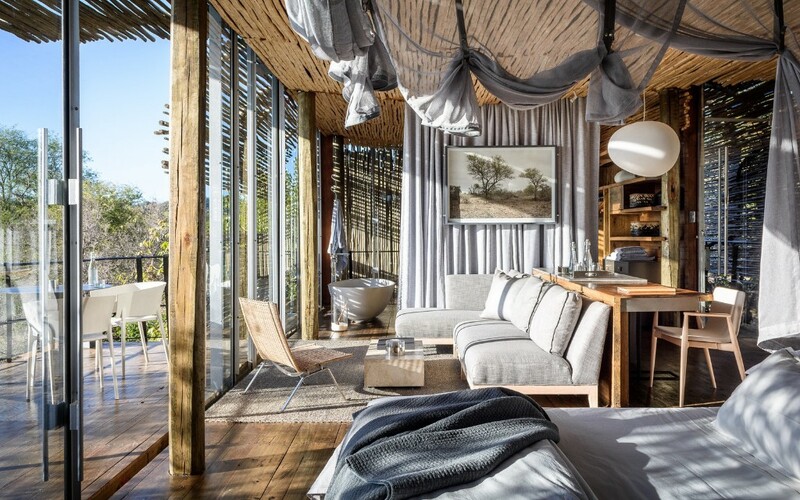 Constructed with an eagle’s loft in mind, a newly renovated eco-lodge in South Africa offers a bird’s-eye view from a well-feathered nest. Overlooking lush vistas of Kruger National Park wildlife refuge, the view is so vast you might easily be inspired to sing a hymn in praise of Creation. 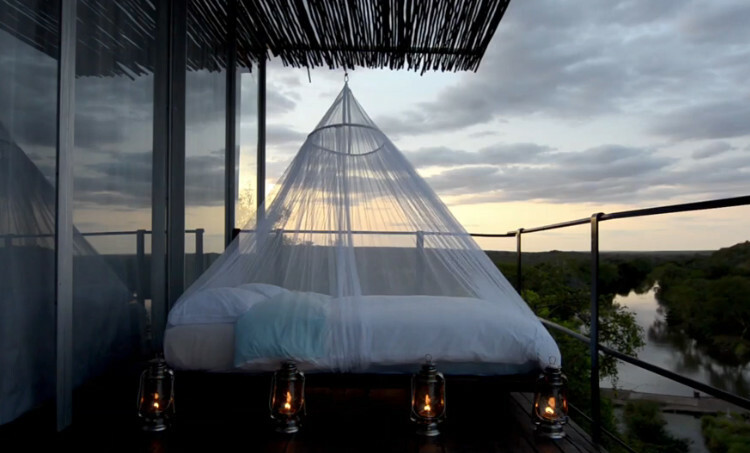 Singita Lebombo Eco-Lodge Resort resides within 33,000 acres of private game preserve bordering the Kruger. Garbed in green, and nestled within nature’s embrace, 15 eco-lodges offer luxurious amenities subtly camouflaged in natural tones and native materials. Subscribing to the indigenous ideology of “Touch the Earth Lightly,” Lebombo is ingeniously constructed with minimal impact on the surrounding land and environment. “Hanging” from a sheer rock face, each eco-lodge is suspended in the fresh, clean air overlooking the converging N’wanetsi and Sweni Rivers. Minimizing the use of concrete, they are supported on wooden stilts and connected to the rock face with steel plates. Solid walls are built of rammed earth, taking advantage of natural color variations to create organic patterns in the walls. 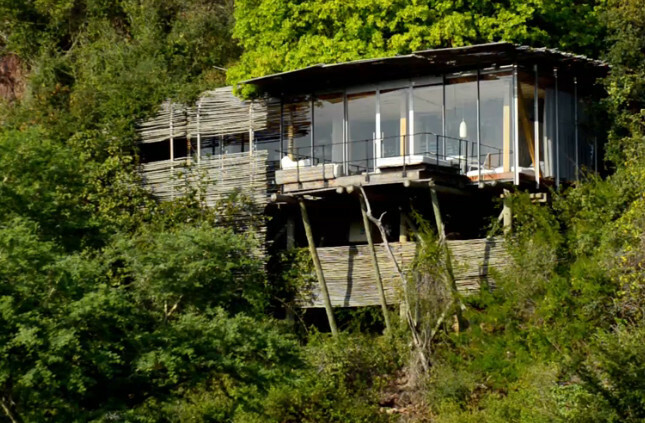 Each eco-lodge is built from bleached wood and glass, with steel work also kept to a minimum. Local plantations supplied the timber, and rocks used in the cladding came from the construction of local roads. With bold, modern floor plans, every eco-lodge features floor-to-ceiling glass walls offering views of the safari stretching as far as the eye can see. Slatted roofs of woven branches provide delicate shade and appealing shadows. Made popular by renowned Architect Glen Murcutt, the phrase “touch the Earth lightly” originates in Australian indigenous wisdom. Greatly impressed and influenced by aboriginal Australians, Murcutt’s life-long friendship with Uncle Max Dulumunmun helps explain this deep connection. Uncle Max is a Yuin elder from the South Coast of New South Wales. A beloved national celebrity, Uncle Max speaks often about the Yuin people’s lore, foods, healing, creation dreaming, spirituality, and strong relationship to both land and animals. Uncle Max relates, “People are saying what are we going to do about climate change, what are we going to do about the ozone layer?” He continues, “They are looking up there at the ozone layer. It is not up there that’s the problem, it’s down here. And this is what I am trying to show people and teach them.” Classifying a tree is not the way to perceive it, according to Uncle Max. Instead, he believes the solution is found by looking at a tree in its environment, to experience it in the context of its purpose in that place. Taking Uncle Max’s teachings to heart through a lifetime of building within the framework of the natural environment, Murcutt’s architectural finesse embodies the spirit of “touching the Earth lightly.” His popular book by this same title has served as a guiding light for environmentally-conscious architects all over the world. Originally built by the Arup team in 2001, the Singita Lebombo Eco-Lodge Resort was built specifically following Murcutt’s motto of “touching the Earth lightly.” An international award-winning resort, Lebombo has been an inspirational green building success since inception. Not only fully powering Lebombo’s 15 suites, the new solar installation is also powering nearby Singita Sweni’s six suites. Nearly 1200 solar panels with battery storage technology are providing power for everything from lighting to energy-efficient air conditioning, as well as the pumps supplying water to the facilities. Just Imagine the Monkeys Running on the Solar Panels! This summer, with a four-month renovation recently wrapped up, Lebombo emerged once again — refreshed, shining, and more green than ever. Bringing in Sally Tsiliyiannis of GAPP Architects & Urban Designers, and Cécile & Boyd for truly amazing interiors, evolutions have respectfully followed in the light footsteps of the original designers. New features include rooftop dining, a wine boutique, a smoothie and espresso bar, a 25-meter lap pool, and a winter lounge and library. Two new family suites can also be joined together, forming a private four-bedroom eco-lodge. Evolving within the framework of the natural environment, Lebombo Eco-Lodge Resort has remained true to Murcutt’s guiding principle of “touching the Earth lightly.” Exactly as Murcutt recommended, Lebombo was purposely built with the reality of human transience in mind. If or when the time comes that the eco-lodge is no longer needed, ease of deconstruction is also built-in. Everything can easily be disassembled and removed without a trace of Lebombo left behind. Even the compacted earthen walls can be broken down, and once again reunited with the hillsides of their birth. The hillsides and mountain faces will still observe the passage of wildlife over the course of time, as they have through countless ages. The eagles will still swoop over the rolling green hills, gliding on warm breezes in search of dinner in the bush below. The view will still be spectacular — this glorious vista wasn’t created for human eyes alone. We are only foreigners living here on Earth for a while, just as our ancestors were. And we will soon be gone, like a shadow that suddenly disappears.